Mildly nutty meringue cradles fresh berries in this classic dessert named for a ballerina. Substitute other fresh fruit, such as blueberries, peeled and cut-up kiwifruit, sliced bananas, pineapple chunks and/or seeded, peeled and sliced peaches, papaya or mango for the strawberries. If you like, substitute finely chopped almonds or pecans for pistachios. Let egg whites stand at room temperature for 30 minutes. Meanwhile, line a baking sheet with parchment paper. Use a 9x11/2- inch round cake pan to trace a circle on the paper. Turn paper over on sheet; set aside. For meringue: Add cream of tartar to egg whites. Beat with an electric mixer on medium speed about 1 minute or until soft peaks form (tips curl when beaters are lifted out). Beat in 2 teaspoons vanilla. Add 1 1 /4 cups sugar, 1 tablespoon at a time, beating until sugar is dissolved after each addition. (Meringue should feel smooth when rubbed between two fingers.) Continue beating on high speed for about 7 minutes or until stiff peaks form (tips stand straight when beaters are lifted). Gently fold in nuts. Spread meringue on prepared parchment paper, creating a 9-inch-wide bowl with a 1/2-inch-thick bottom and 2-inch-tall sides. Bake in a 300 degrees oven for 30 to 35 minutes or until meringue is cracked on top. Turn off oven. Let meringue shell dry in oven, with door closed, for 1 hour. (Do not open oven door while drying. This allows the meringue to dry out completely, producing a crisp shell.) Carefully peel or lift the meringue shell off the paper. Transfer to a wire rack; cool completely. For whipped cream: In a clean large mixing bowl, beat whipping cream, the 1 tablespoon sugar and the 1/2 teaspoon vanilla with an electric mixer on medium speed or with a whisk until soft to almost stiff peaks form. Place cooled meringue shell on a serving platter. Top with the whipped cream, spreading nearly to edge. Arrange the 3 cups sliced strawberries on top of cream. Cover loosely and chill for 2 to 24 hours before serving. For sauce: In a blender or food processor combine the 2 cups strawberries and the 2 to 3 tablespoons sugar. Cover and blend or process until smooth. Press berry mixture through a fine-mesh sieve; discard seeds. Chill, covered, for up to 2 to 24 hours. 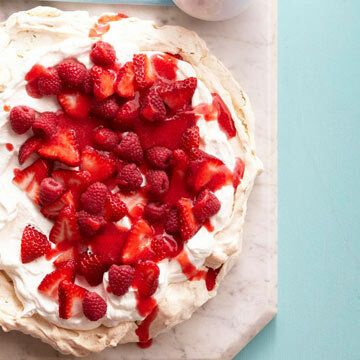 To serve, spoon the sauce over the berry-topped pavlova. To slice, dip a knife into hot water before cutting each wedge.